A window for the river. What awful weather! Since we got back from our holiday it's been so unpredictable it isn't true. When it comes to the local rivers they just seem to start clearing again when down comes another deluge. Anyway, the other day I managed to find a slot when the water was only the colour of weak tea and not so high as to be dangerous so I went to try spinning. My objective was to go for a 'grand slam' of perch, chub, trout and pike (not so keen on the latter when I'm using smallish lures). 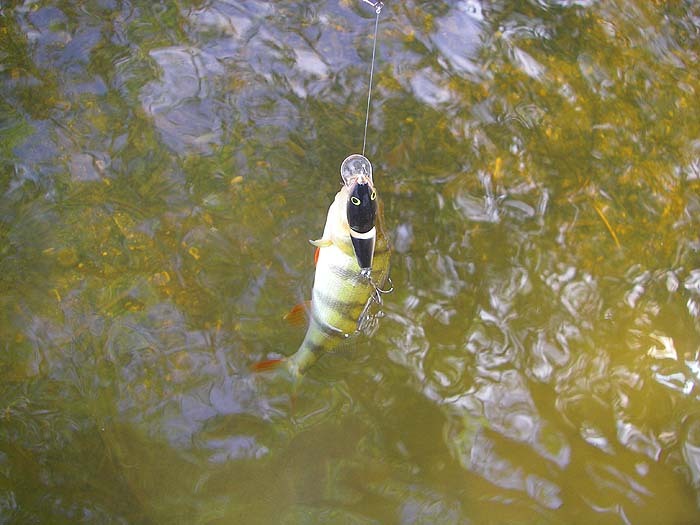 I tackled up with a J9 Rapala on a fifteen pound wire trace and began to fish. My first bite, in the shallow tail of a big pool, turned out to be a smallish trout which I duly returned before moving on. Next I missed two bites - both small chub I think, before catching a couple of tiny perch which chased the plug across the shallows from a weedy patch. Two down two to go. 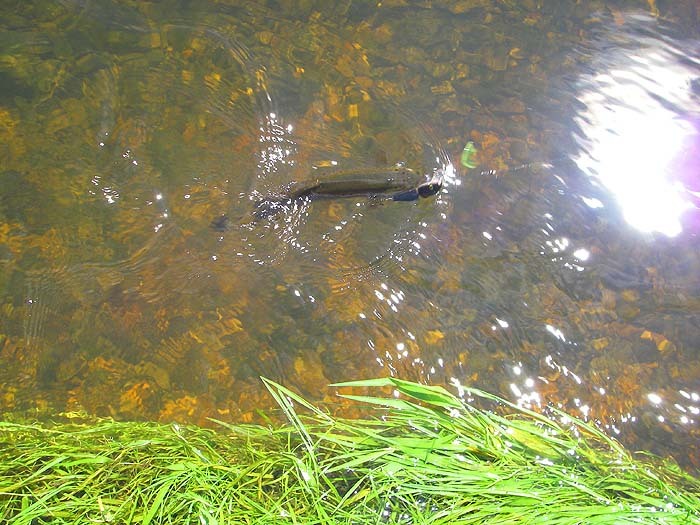 I moved on again and tried a very trouty spot with two or three feet of water pushing on hard over a gravel bed. 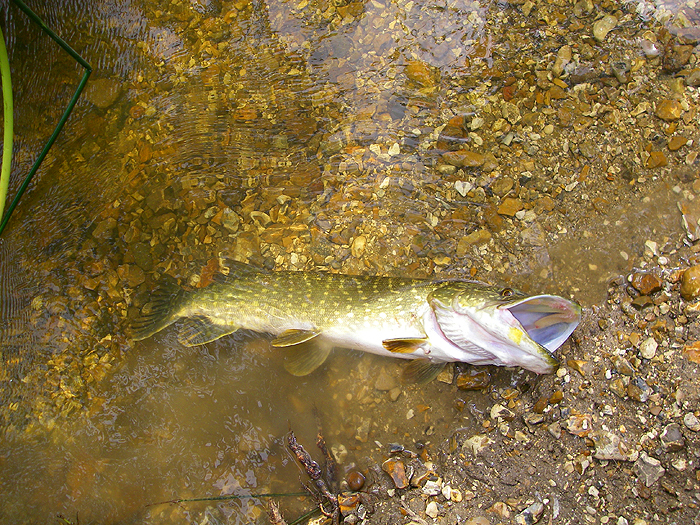 Another bite missed (chub again I think) before the lure swung into a position directly downstream of where I stood in the shallow water. Crash!!! The rod whanged round as the plug was taken. Line zipped off against the clutch and I hung on as the fish ploughed through some fine tree roots and overhanging brambles. It was a couple of minutes before I had any control but by then I was sure I'd hooked a pike. Eventually I beached the fish (seven or eight pounds) before taking its picture and letting it go. 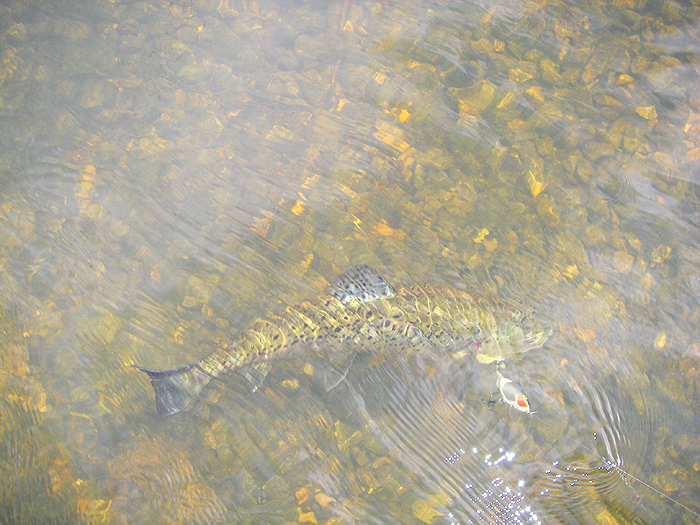 On the way back upstream I had another trout, bigger than before. By the time I landed it the front treble had come out and it was held by only the tail hook stuck in the edge of a gill cover. That was it for the session. Not a bad start but pity about the chub.